The quickest way to handle a major cleanup around your home is to bring in some help. It’s easy if all you have to do is toss out a pile of magazines or fold laundry. But when you’ve created a situation that makes your home look like a hoarder’s residence, then it is definitely time to bring in some extra hands. Those can be found by placing a call to Junk King. These are the junk removal professionals who never met a pile of rubbish they couldn’t haul away! You shouldn’t feel embarrassed about asking Junk King for help with your decluttering. The crews have seen all kinds of mess from abandoned foreclosed homes to properties overrun with cats. In either situation, you can depend on a friendly and fast removal of all your unwanted items. Before the Junk King crew arrives for their appointment, you’ll want to sort through all the things you want to get rid of. This will help things move quickly. When the crew arrives, you’ll show them all the items you want taken away. You don’t have to bring anything down from the attic or up from the basement. The Junk King crew will go to your junk. After they’ve had a chance to see everything, they’ll present you with a fee based on an estimate of how much space your junk will occupy on the back of the truck. That flat fee covers all aspects of the job from start to finish. It’s also a price that will be locked down. There won’t be any surprise charges at the end of the session. Suppose your junk takes up more room on the truck? You’ll still pay that original estimate. This is a fair deal with the best prices in Albany. Also covered in that fee will be the recycling services that Junk King provide. Long after they leave your home with your stuff, Junk King will devote extra hours to sorting and dropping off. They might make several drop offs to various recycling centers and charities. The goal is to keep as much junk out of the landfills as possible. That is a mission Junk King is happy to take on. 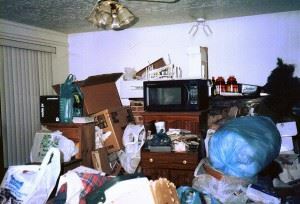 Whether you need a hoarder cleanup or just a few bulky items removed, Junk King has you covered. This entry was posted in How To Help An Albany Hoarder and tagged hoarder, Junk King, junk removal on July 26, 2015 by Todd Porter. Last updated August 1, 2017 .